Make it easier to see who needs access. You’ll now see the names or email addresses that don’t currently have access to the file in the Access checker interface. Support more file types in Drive. Access checker will now support files in a Team Drive. Share directly with those who need access. Access checker will anticipate who needs access to a file and intelligently default to sharing with those recipients only. You can share with these intelligent default settings in just one click, or choose a different sharing option for the file. 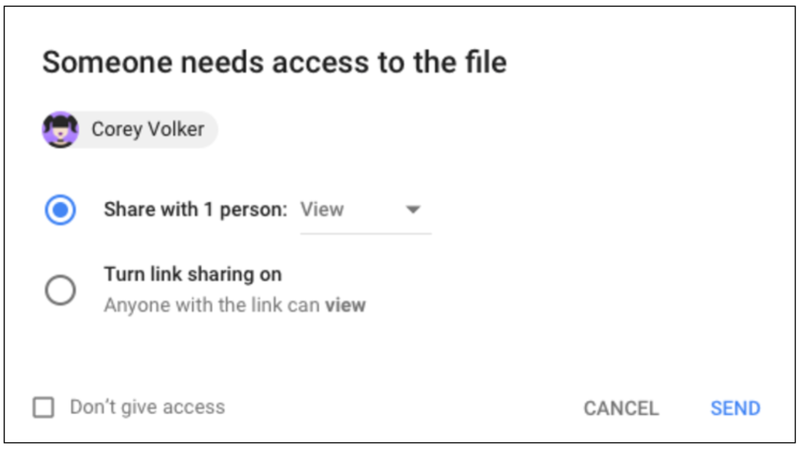 Before, the default share option was “turn link sharing on.” We hope this change makes it easier for you to ensure that only the right people have permission to access your files. Note that all sharing settings configured for your domain (or OUs) will remain the same. This launch respects the settings you’ve already chosen for Sharing outside your domain, Access Checker, and Link Sharing Defaults. If you’ve chosen to limit Access Checker to Recipients only, link sharing will not be suggested. These updates are based on your feedback, and we hope they deliver a sharing experience that is simple, secure, and anticipates your users’ needs. Share with recipients (default), share link within your organization, share link with anyone (no Google account required). Share with recipients (default), share link within your organization. See our Help Center to find out more about how to configure Access checker for your organization. Extended rollout (potentially longer than 15 days for feature visibility). Rollout to scheduled release domains will begin one week after rollout to rapid release domains is complete. Google Drive makes it easy to share files through Gmail, Calendar, and other apps with a feature called “Access checker.” When you send an email, calendar invite, or other communication that includes a Drive file, Access checker automatically looks to see if the people you’re sending the message to have permissions to view the file. If they don’t, Access checker asks if you want to change the permissions before you share the file.